This quote is the text chosen as the opening to Jigyasa Giri and Pratibha Jain’s absolutely gorgeous, award-winning book, Cooking At Home With Pedatha: Vegetarian Recipes From a Traditional Andhra Kitchen, and it sets the tone for the entire work, which is the exploration of the soul of a cuisine through the memories and orally-transmitted recipes of one amazing woman. Her name is Subhadra Krishna Rau Parigi, and she is the eighty-five year old eldest child of a former president of India. A wise cook knows that she is right, of course. How long a certain dish takes to cook will depend on how and where it is cooked. How high is the heat on your stove? If it is higher than Pedatha’s, it will cook faster. If it is cooler than Pedatha’s it will take longer for the same dish to cook properly. A wise cook and reader will recognize that Pedatha’s advice, while seeming to be evasive are nothing more than a simple truth: not every bit of cookery can be measured, quantified and recorded perfectly and accurately. Cooking is not wholly a science and thus is entirely subject to the clock, the thermometer, the scale and the measuring spoon. It is also an art that is dependent upon the senses of the cook: her eyes, her nose, her hands, her ears, her mouth, to tell her when something is cooking properly. But enough about Pedatha, already! I can hear my readers thinking this–tell us about the recipes! 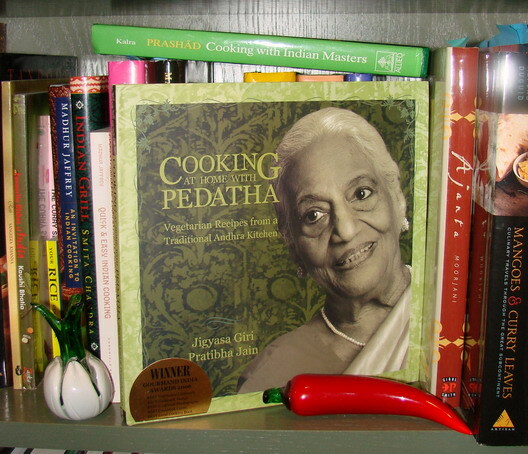 Ah, but you see–the book is as much about Pedatha as it is about the recipes. The way they are written, and the way the book is put together, with lovely photographs of ingredients and finished dishes, along with evocative portraits of Pedatha’s mobile and ever-changing face–I swear, it seems as if I can hear her voice on every page. It is like having her in the kitchen with me, telling me how to temper spices, or how to tell when curry leaves are cooked enough, or what these pickles will smell like when they are done. I haven’t cooked yet from this book, but as the summer season begins to progress, bringing its delightful bounty of fresh vegetables, I intend to cook many dishes from this book as I explore and experiment with the flavors and traditions of southern India. Have no fear, I will present the recipes as I test them. I feel as if, with Pedatha guiding me from the bookshelf and Indira of Mahanandi a keystroke away, I cannot go wrong as I take my first baby steps in learning the ways of the South Indian kitchen. Not with two such wise and generous kitchen angels looking over my shoulder. So, dear readers, if you are interested in learning how to cook the vegetarian foods of South India, particularly Andhra Pradesh, I urge you to pick up a copy of this book, sit down and enjoy a good, thorough reading of it. Then, go to the kitchen and start cooking. And then after you have cooked a dish or two, check in on Mahananadi for another dose of inspiration and kitchen wisdom. i have cooked nearly half a dozen recipes from this book, and written about some of them. you will enjoy this book immensely. Thanks for reviewing this book, I wholly agree with her way of looking on cooking, it’s very much based on using all your senses. I’m looking forward to see what you think about the recipes in action! This looks like a book which has as much food for the soul as for the body — something which we desperately need in the West. What a sweet review! You have captured the essence of pedatha’s wit and wisdom. I can’t wait for the summer series. I love this book! I have not cooked much from it yet, but it is a joy to read. Pedatha is beautiful and lively, as is her philosophy of cooking. I often make up podis to have around for nights when I am too tired to cook and just want a rice/podi/ghee dish with a salad on the side., Since discovring them have realized there is a whole side of Indian cuisine that is totally unknown to me. I am fascinated by podis. I look forward to your reviews, and hope to have a “dialogue” on the book comparing recipes! Im glad you have that book. Its my turn to make those dishes and turn nostalgic. I miss my grandma’s cooking too. Made Raw Mango Chutney and it turned out yummm. Can’t stop licking my fingers! Their other recipes are so simple and yet so delectable!